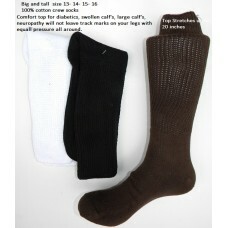 Comfort top 100% cotton socks are a bit thicker than the dress socks but not padded. Breathable sock that features 100% cotton woven honeycomb socks enableing it to expand around the calf and stay up with minimal pressure. 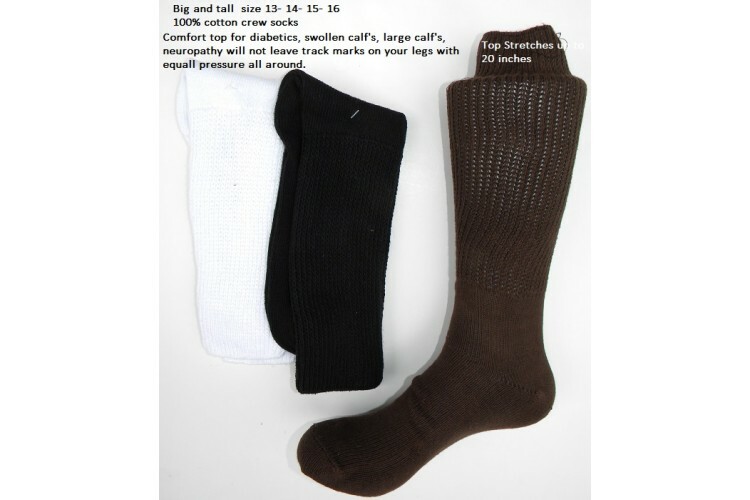 If you have large or swollen calfs and ankles this sock can expand up to 22 inch in diameter. This sock has thin strands of nylon running on the top 3 inches to hold socks in place, read below for details. It has no nylon reinforcement in the body and is pure cotton. Please note: this sock is 100% cotton from toe to the upper rim of the socks, is it important to point out that elastic is needed in any sock in order for the sock to stay up, this is not a non elastic sock, this is a sock constructed with 100% cotton from toe to rim. In reality this sock and any other socks that is labeled 100% cotton has between 3-5% elastic on top needed to hold the sock in place. All socks have elastic up in the rim but they also contain 20-25% of nylon reinforcement through out the sock for durability, our 100% cotton socks forgoes the reinforcement of the sock making it a truely 100% cotton sock from toe to rim, just a single thin strand of elastic on top to hold the sock in place.